The first ever evidence of a comet entering Earth's atmosphere and exploding, raining down a shock wave of fire which obliterated every life form in its path, has been discovered by a team of South African scientists and international collaborators. The discovery has not only provided the first definitive proof of a comet striking Earth, millions of years ago, but it could also help us to unlock, in the future, the secrets of the formation of our solar system. "Comets always visit our skies – they're these dirty snowballs of ice mixed with dust – but never before in history has material from a comet ever been found on Earth," says Professor David Block of Wits University. The comet entered Earth's atmosphere above Egypt about 28 million years ago. 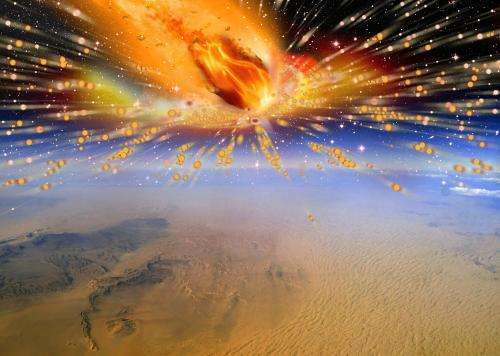 As it entered the atmosphere, it exploded, heating up the sand beneath it to a temperature of about 2 000 degrees Celsius, and resulting in the formation of a huge amount of yellow silica glass which lies scattered over a 6 000 square kilometre area in the Sahara. A magnificent specimen of the glass, polished by ancient jewellers, is found in Tutankhamun's brooch with its striking yellow-brown scarab. The research, which will be published in Earth and Planetary Science Letters, was conducted by a collaboration of geoscientists, physicists and astronomers including Block, lead author Professor Jan Kramers of the University of Johannesburg, Dr Marco Andreoli of the South African Nuclear Energy Corporation, and Chris Harris of the University of Cape Town. At the centre of the attention of this team was a mysterious black pebble found years earlier by an Egyptian geologist in the area of the silica glass. After conducting highly sophisticated chemical analyses on this pebble, the authors came to the inescapable conclusion that it represented the very first known hand specimen of a comet nucleus, rather than simply an unusual type of meteorite. Kramers describes this as a moment of career defining elation. "It's a typical scientific euphoria when you eliminate all other options and come to the realisation of what it must be," he said. The impact of the explosion also produced microscopic diamonds. "Diamonds are produced from carbon bearing material. Normally they form deep in the earth, where the pressure is high, but you can also generate very high pressure with shock. Part of the comet impacted and the shock of the impact produced the diamonds," says Kramers. The team have named the diamond-bearing pebble "Hypatia" in honour of the first well known female mathematician, astronomer and philosopher, Hypatia of Alexandria. Comet material is very elusive. Comet fragments have not been found on Earth before except as microscopic sized dust particles in the upper atmosphere and some carbon-rich dust in the Antarctic ice. Space agencies have spent billions to secure the smallest amounts of pristine comet matter. "NASA and ESA (European Space Agency) spend billions of dollars collecting a few micrograms of comet material and bringing it back to Earth, and now we've got a radical new approach of studying this material, without spending billions of dollars collecting it," says Kramers. The study of Hypatia has grown into an international collaborative research programme, coordinated by Andreoli, which involves a growing number of scientists drawn from a variety of disciplines. Dr Mario di Martino of Turin's Astrophysical Observatory has led several expeditions to the desert glass area. "Comets contain the very secrets to unlocking the formation of our solar system and this discovery gives us an unprecedented opportunity to study comet material first hand," says Block. So, 28 million years ago puts it in the Paleogene period (according to Wikipedia). Is this why a lot animals and plants back then vanished? Yeah, but it's not exactly the same thing, since what's left of the comet has been superheated and compressed by immense shockwaves to the extent that all the chemicals have been reorganized into completely different forms. But I suppose it's better than nothing. There appear to be dormant comets in the main belt. I would love to see a mission directed at sampling one of those. Asteroids and comets are so easy to approach, with their super low gravity. It's just such an easy target for a sample return mission, relatively speaking. Remember guys: We see a slight sidereal component to the radioactive decay rates. The question which should be lingering in the back of peoples' minds is whether or not catastrophic events acts as amplifiers for that anomalous rate decay. Re: "There appear to be dormant comets in the main belt." Yes, and every single one of them will be observed to have an eccentric orbit. Re: "I would love to see a mission directed at sampling one of those." They will look just like the asteroids, btw, because that's what they are: Asteroids on eccentric orbits moving through the Sun's electric field. I don't mean to offend, but cometary theory should be a test for critical thinking. It's the most obviously wrong theory of all conventional theory. People believe it for the simple reason that the people telling them to believe it are "experts". The evidence for dirty snowballs beneath the rock layer is laughably weak. One need only look at the full history of comets to observe that electricity plays an important role. There have been comets which were observed to break apart, and then the pieces were connected by electrical bridges. No, there are some that have taken up stable orbits in the belt. No, we know they aren't dense enough to be made of rock. The current best guess is that they are ice on the inside, with a layer of dark organic material coating the outside, which keeps them from sublimating away to nothing. Seriously, where do you come up with your nonsense? dirty snowballs below a rock layer? What rock layer? I think you're thoroughly confused. As the volatiles boil away, it leaves a residue of materials with higher boiling points, mostly organic material. It is a kind of resin or tar with lots of carbon mixed with other non-volatiles. what the heck are you talking about? did you take a double dose of your meds by mistake? wow, maybe you should go to the emergency room. I'm worried you might have overdosed on something. I don't mean to offend, but cometary theory should be a test for critical thinking. Is it any wonder why not so swift doesn't get it. The article only mentions this obtusely (Tut's amulet) but the author's are saying that this is the source of the Lybian desert glass (which isn't the only population of tektites in North Africa). An atmospheric event is not going to cause a mass extinction. There are two craters dated 35Mya, diameters 85km and 100km. No changes in weather or extinctions are correlated, and they actually hit the ground. It's interesting that people simply accept the dates without question -- even when catastrophic impacts are involved. Simple. I trust Science more than I trust hammerheads and douche bags. Radiological dating is not the only weapon in a Scientists' arsenal. The glass is common to one geologic horizon. Known plants, animals, magnetic fields (where is North?, how that squares with tectonics) and climate proxies are also used to estimate date. The more data, the more accurate the date. Yep, and much of that data is used in a circular pattern of self confirming bias based upon the "standard" cosmology. Such a cosmology cannot explain such anomalies such as Mohenjo-Daro and it's glassified walls and relics without resorting to ancient aliens and their nuclear weapons. There have been comets which were observed to break apart, and then the pieces were connected by electrical bridges. @HannesAlfven - would you be so kind as to share with us the data and evidence which supports this please? if one is to learn, one must learn with empirical data, not just hearsay. Ooops, I stand corrected. Not this comet, and not the extinction event that happened around this time span. I should've looked it up. The KT event happened a few million years prior to this, and that's what I was thinking about. Cannotdrive? When does the age dating objects and horizons become inaccurate? More than 100 years ago, 1000 years, 10,000 years? wow are you for real. i thought you were anti science. but inbetween you have bouts of sanity. It depends entirely upon the events that can alter the expected results. Also take for example ice core records, it is ASSUMED that each layer indicates a full season. If each layer were in fact an indication of individual storms, the assumed time frames would be altered dramatically. Oops I guess I read part of the first paragraph wrong. My bad. Strange. I'm not sure why so many species during that time period were wiped out or just vanished.